If you've poked around some of the articles I've written, checked out my blogs, or taken a test ride on one of my own personal trikes, you've no doubt realized that I'm pretty particular about my gears -- especially my high gears. The fact is I like to go fast. When I'm commuting on level ground I like to keep my speed between 20-25 MPH. When I am going downhill I like to go as fast as possible. I hate it when I run out of gears and start to spin out. For this reason I've found the stock gearing on all the WizWheels Trikes too low for my taste. If you're like me then you may be considering some different gearing options for your trike. In this article I'll be using "Gear Inches" to indicate gear ratios so we can have a common reference point to compare the different gearing options. Gear inch (GI) is a measurement of the distance traveled by the wheel for every one revolution of the pedals. A typical mountain bike might have a gear inch range of 18 - 103 and a typical road racing bike could have 43 - 127. A good range for all around riding is about 20 - 90. A cool feature of the WizWheelz trikes is that they all feature 20-inch wheels all the way around. The nice thing about this is that you only need to carry one spare tube size, and you can have all the same tires. Having smaller wheels also makes them stronger and less likely to flex or bend when turning. The bad news is that your gear range suffers because the front chainrings and rear sprockets were originally designed for 26 to 29-inch tires for mountain and road bikes. Let�s see what happens when we take the same gears and use smaller tires. For these examples I�m using the very common 11-34 rear sprocket cassette, and a triple chainring configuration with 24, 42 and 53 tooth gears. Values derived by using the gear calculator on sheldonbrown.com. As you can see from the results above, as the size of the wheel gets smaller the whole gear range shifts down. The result of putting a standard 11-34 cluster on a 20-inch wheel is to shift the whole gear range down 34 Gear Inches at the high-end. At the lower end the resulting 18GI actually becomes a benefit and makes it easier to climb hills. 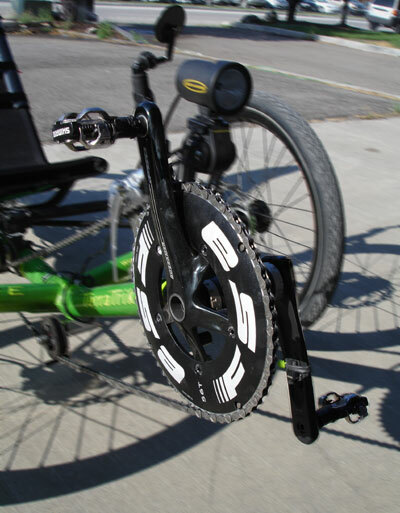 This low gearing is greatly appreciated among recumbent cyclist because we don�t have the advantage of being able to stand on the pedals to get up the hills. For the extreme cyclist, the lower top-end gearing soon becomes a limiting factor. A fairly conditioned rider may have an average cadence of 85 rpm. If we take the gear inch figure from the chart above for our highest gear, at 85 rpm our speed will be about 24 MPH. While this speed is great for just cruising around town, you�ll never set any records. If you like to pedal down the hills to build up speed you�ll also be limited. While the entire gear range is lowered with our 20-inch wheels, most recumbent cyclists WILL appreciate the low gears for climbing hills. The trick is finding a way to keep the low gearing while increasing the top-end range of gears. There are a few different approaches to resolve this and all involve making modifications to your trike�s existing drive train. The ideal goal is to create a gear-inch range of about 18 to 130 GI, enabling us to climb any hills and fly down any hills without spinning out. On my regular commuting trike (modified Cruiser) I have a modified 16-speed drivetrain with a gear range of 17 to 128 inches. I have never met a hill that I could not climb and I can still pedal while going down hill at 50MPH (at about 130 cadence). While these are the extremes of my gearing, I typically only use my top two gears going downhill. I spend most of my time in my 13th and 14th gears (which I call 5H and 6H). My 5H gear is 80GI and I use it for going 19-24MPH. My 6H gear is 97GI and I use it for going 24-28MPH. As you can see, my 6H gear is just a little higher than the 96GI-high-end from the stock gearing. So, why, you may ask, do I care about getting higher gearing if I spend most of my time in the 80-97GI range? Well, there is something about knowing that I always have 2 more gears, plus every day I have a couple hills that I like to go at least over 45MPH down them. Plus, I should also mention that my trike, as snazzy as it looks, is a tank! With all the accessories and baggage it typically weighs about 65lbs. So, when I get on one of the lighter trikes (like the WizWheelz RACE or WizWheelz EDGE for instance), their stock top-end gears don�t even begin to push my limit on level ground. There are several ways that we can go about changing our top-end gearing. Some solutions require major modifications to your trike, while others are simpler. Also some riders may not need as high of a gear range as 130GI, so a lesser modification may be in order. All the WizWheelz trikes come with a standard rear hub wheel that has an 11-tooth sprocket as the highest gear. So first I�ll talk about making some modifications to the front chainrings and derailleur and leaving the rear end alone. Since most of our trikes will have a triple chainring of 24/42/53(or 52) the easiest modification to get our gearing would be to swap out our largest chainring for an even bigger one. Since our low-end gearing is determined by the 24-tooth chainring it would stay the same. So first let�s use some math and figure out what size chainring we would need to get a 130GI top end with our 11-tooth rear sprocket. Using Sheldon Brown�s calculator again I find that we will need a 72-tooth chainring. Hmm. I immediately think we�ll have a problem with that. First, I tried finding one online and had a hard time locating one. Second, a 72T chainring would not work with our derailleur. Third, a 72T chainring would create an extreme angle in our chain line, and unless we also have the TerraCycle Idler up front, it would rip the stock idler to shreds pretty quickly. Fourth, a chainring that size would be like a huge saw blade and would eventually catch the hair in your leg and rip it out. So, if we change nothing else but the larger chainring we�ll go from 96GI to 102GI. Doesn�t sound like a lot, but let�s see what kind of speed changes we could see. With an 80RPM cadence we would see an increase of speed from 23MPH (53T) to 24MPH (56T). At 120RPM cadence we would see a difference of 34MPH (53T) to 36MPH (56T). So, in effect we are looking at $70 to pick up an extra 1-2MPH potential speed increase. Better than a $500+ fairing, I suppose. 56T chainring is easy to find. Works with Tiagra and Ultegra derailleurs. Easy to upgrade, with minimal modifications to trike. Larger than 56T chainrings hard to find or requires major modifications. For details on installing a larger chainring click here. Wow, so we even get a slightly lower end, and our high-end gearing is looking pretty nice. Let�s check out our speeds again. With an 80RPM cadence we would see an increase of speed from 23MPH (Stock 53T) to 29MPH (67.5T Schlumpf). At 120RPM cadence we would see a difference of 34MPH (Stock 53T) to 44MPH (67.5T Schlumpf). Wow, with those numbers I think we could stop and keep most people happy, but there still might be some hills you can�t pedal down, so let's keep going. Elegant solution, replaces entire front derailleur and chain rings. Eliminates possibility of cross chaining. Small 27T chainring promotes nice chainline. Easy to swap cranks for different sizes. Gives even lower end gearing. Can be shifted when stopped. Needs to be installed with special tools. Internal gears are only 95% efficient. So, in the front we have a couple of solutions available. Going with a 56T chainring is easy enough if you have a front derailleur that can handle it. If you are riding near your limit with the 53T chainring, then getting the extra 2MPH from the larger chainring might be worth it to you. The Schlumpf High Speed Drive provides a very nice gear range and eliminates the need for some other components. It is fairly costly though and does provide a slight loss in efficiency. The nice thing about these Front End options is that they CAN be combined with other rear end options. The stock 11-34 MegaRange cassette found on most stock trikes gives us 8 or 9 gears (depending on the cassette) and a pretty good range. In order to get a higher top-end gearing we need to change the gearing more than what the 11T sprocket can do for us. The problem is that the smallest sprocket that will fit on the standard Shimano-style hub is the 11-tooth sprocket. Here we see an even lower bottom end, and just a slightly higher top end. With an 80RPM cadence we would see an increase of speed from 23MPH (Stock 11T) to 24MPH (17T Nexus 8). At 120RPM cadence we would see a difference of 34MPH (Stock 11T) to 36MPH (17T Nexus 8). If we could find or modify or find an even smaller sprocket like a 16T our top end would get even higher. Cost: Hub, wheel, shifter, and idler/tensioner is $500-$600. Shift at anytime � rolling or stopped. Easy to play with different ratios. Need a whole new wheel. Need to run an addition idler or modified derailleur to take up chain slack. May need to modify mount to get it in. May need to modify the sprocket. Only 80-95% efficient compared to derailleur. While it appears that there are more cons than pros, I still love this hub. Being able to shift at any time, while not a focal point of this article, is a huge benefit. The gear range is good and can be moved up or down to suit your own preference by just changing a single rear sprocket. Those numbers are pretty good. With an 80RPM cadence we would see an increase of speed from 23MPH (11T) to 28MPH (9T). At 120RPM cadence we would see a difference of 34MPH (11T) to 42MPH (9T). My favorite thing about this setup is that all the modifications are made to the wheel, and not the trike itself. You can just pop the wheel off and replace it with the stock one if needed. Cost: Hub, cassette, wheel w/assembly about $200-$300 depending on the wheel. Does not require a different derailleur if you have a 9-speed. Only works with 9-speed derailleurs. Currently hard to find in the US, so you may have to import it. While there may be other solutions available that others have tried, I only wanted to talk about things that I have tried. I am currently working on one more exciting option and that is mounting a 26-inch wheel on the back of a TerraTrike. More details on that to come soon. In the meantime, we can get even better results than those mentioned above when we combine the front-end modifications with the rear-end solutions. I personally have trikes set up with two combinations as detailed below. Less efficient due to all the internal gears. Slightly heavier than stock gearing. While being less efficient, this combination really gives me the high gearing I like for going downhill, while still giving me the low end to climb any hill. There are certain gears where the two internal gears vibrate together and I hear a rumble sound, but overall I don�t notice that it is terribly inefficient. Cheapest solution to raising your gears. Gear range still not quite high enough. Once I have the results of the big wheel modification I�ll let you know!